I’m sure we’re all fans of Hayao Miyazaki, here. That’s the assumption, at least, since I’ve yet to meet anyone who isn’t. And that is why we should all be looking forward to Rakuen, an adventure game inspired by The Legend of Zelda, Miyazaki films, and the definitive retro adventure game, Maniac Mansion. Do I have your attention now? Good. Rakuen is about a boy, his mother, and a story book. It features colourful, expressive pixel art alongside whimsy portraits against a background of fantastic music. Headed by former Plants vs. Zombies developer Laura Shigihara, Rakuen skirts convention by not featuring a battle system. Instead, it focuses on puzzle-solving gameplay and story. Rakuen blends fantasy and reality with myth and mystery. The main character, currently only referred to as The Boy, is sick. His mother has always read him a story about “Morizora’s Village”, a tale about a boy whose tribe sets sail to a mythical isle called Rakuen, and his journey to reach them. He and his mother then travel to the fantasy world within the book, and during their adventure they uncover the ties between the mysterious hospital and the patients that reside within. In Laura’s own words, Rakuen deals with “questions about empathy, hope, and what it means to leave behind a legacy by coming to terms with your own story”. 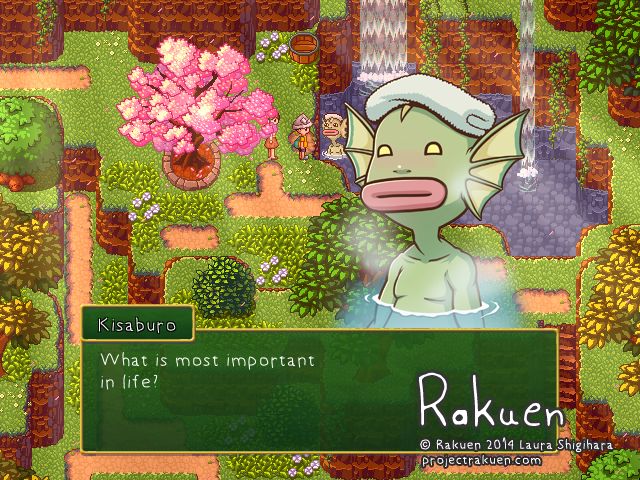 If all goes well, Rakuen will be released by the end of 2014, and will contain about 10-15 hours of gameplay. If you’d like to support the development of Rakuen, the amazing soundtrack is available for pre-order on Bandcamp. Or retweet and spread the word about this gem in the making.